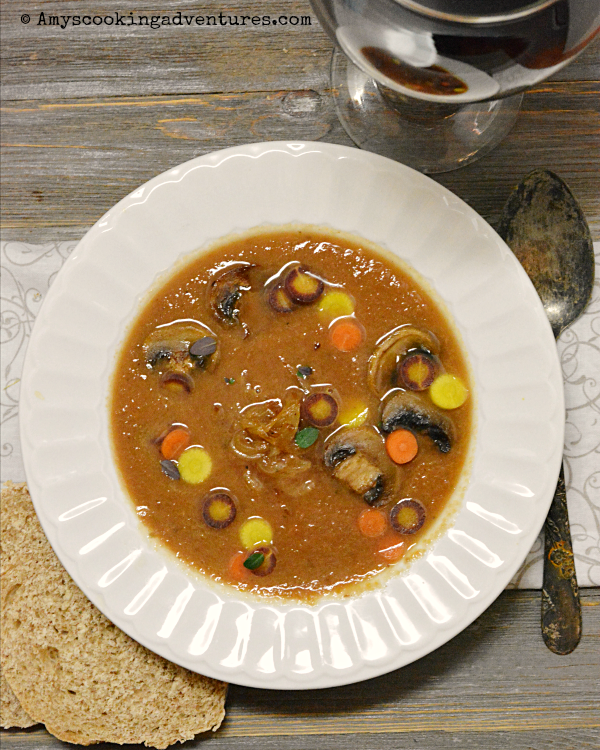 Holy moley, let’s talk amazing soup! It’s time for Soup Swapper Saturday, and this month’s theme is French Soups! I admit, I was a bit flummoxed as first. French soups? I had no idea what to make. 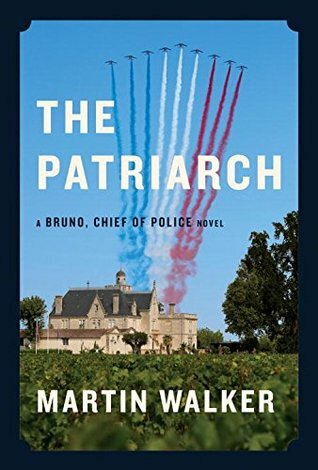 Then I picked up this month’s Cook the Books Club pick, The Patriarch by Martin Walker, which is set in France! So as I read, I was keeping my eyes peeled for any mention of soup! I love it when things work out like that! The book is the eighth in the series “Bruno, Chief of Police”. I feel like that was part of why I was so incredibly underwhelmed by the story. I typically prefer to start at the beginning of a series, if at all possible. But when the chosen book is the 8th in a series, it’s tough to do! I found the characters to be boring and one-dimensional (I could hardly tell them apart), but part of that could be the fact that it’s a long series. In a series, sometimes the development happens throughout several stories. 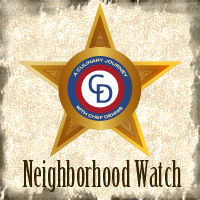 Additionally, the plot was very entrenched in small town politics as well as cold war Russian politics. Snooze. Plus, it ended super abruptly and I really don’t like that. Anyhow, in the entire book, most of the foods mentioned were things I’d never make ever – like a lamb shank or wild boar. Um. No. There was also one single passing mention of soup. Carrot Soup with Ginger. Totally not something I’d normally make, but I was willing to give it a shot. And wow, was I glad I gave it a shot! It was amazing! I started with tri-color carrots, because I love them, but regular orange will work well too (and give you a prettier soup to be perfectly honest here). I started layering my flavors and adding herbs, but when I tasted it, it was rather one-dimensional (just like the book). Then I remembered one other foodie scene in the book, wherein Bruno’s soon to be ex-girlfriend drizzles Worcestershire sauce onto his lamb roast. He seems to think this is very unconventional, but it turns out to be amazing. So, I thought, why not? I tossed some Worcestershire sauce into my carrot soup and it was delicious! It was exactly the boost it needed! Place the carrots, onions, and garlic on a lined baking sheet. Drizzle lightly with olive oil and season with salt and pepper. Bake in the preheated oven for 30 minutes, stirring occasionally, or until the garlic is beginning to brown and carrots are tender. Meanwhile, melt the butter in a skillet over medium-low heat. Add the onions and stir to coat. Cook, stirring frequently until the onions have caramelized to a deep amber color. Remove from pan and set aside. Put the mushrooms and a bit more butter in the same skillet. Cook until the mushrooms are lightly fried. Place the cooked carrot mixture, herbs, and broth in a soup pot. Heat through, then puree with an immersion blender. 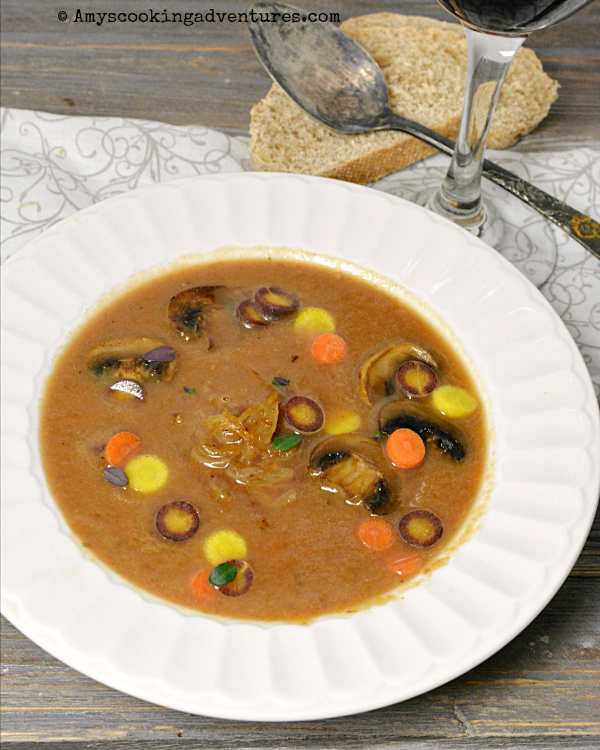 Serve soup topped with caramelized onions, mushrooms, and fresh herbs. Preheat the oven to 400 degrees.Place the carrots, onions, and garlic on a lined baking sheet. Drizzle lightly with olive oil and season with salt and pepper. Bake in the preheated oven for 30 minutes, stirring occasionally, or until the garlic is beginning to brown and carrots are tender.Meanwhile, melt the butter in a skillet over medium-low heat. Add the onions and stir to coat.Cook, stirring frequently until the onions have caramelized to a deep amber color. Remove from pan and set aside.Put the mushrooms and a bit more butter in the same skillet. Cook until the mushrooms are lightly fried.Place the cooked carrot mixture, herbs, and broth in a soup pot. Heat through, then puree with an immersion blender.Serve soup topped with caramelized onions, mushrooms, and fresh herbs. I adore ginger, and love a carrot soup, so both together make me dream.... intrigued by the book, but from what you said, I think I'll stick with the soup and pass on the reading! thanks for joining us for this month's event! Yes, I didn't care for the book either and for the same reason. The characters were not developed in my opinion. I however loved all the food...wild boar...yes, please. Your soup sounds absolutely delicious. I would never have thought to add Worcestershire. 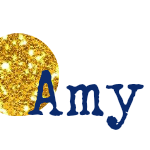 This is so pretty Amy! I think the tri colored carrots are prettier, and tone down the bright orange. I love the flavor ginger adds too. This bowl of soup is so delicious. Like you, I prefer to get rainbow carrots, but depending on what you are making the color may not be as vibrant. I like that you sliced some to add to the soup: the result is beautiful. I am not a Worchester sauce fan, but it sounds like it is a secret ingredient worth having.